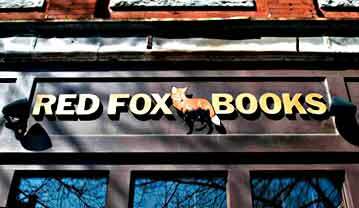 Farewell, Red Fox Books - You Will Be Sorely Missed! For five years, Red Fox Books has been a hidden gem at 28 Ridge Street in downtown Glens Falls where owners Susan and Naftali would greet you with a smile and help you find what you were looking for, whether it was a bestseller by John Grisham, guilty pleasure romance novel, intriguing political biography or a Little Golden book -- yes, even out of print books! Thank you to Red Fox Books for being a great breath of fresh air in this highly digitized, fast-paced world. It is with a heavy heart that we must bid a cherished piece of Glens Falls charm farewell this September as Red Fox Books closes on September 15, 2011. According to the letter on their website, the slow economy and the transition from physical books to e-books is to blame for this decision -- admittedly a very difficult decision for them to make. "It is with great sadness that we announce our decision to close Red Fox Books. It is less a decision than a necessity, and it's one that we have not made lightly. We have loved our role as booksellers in this community, and we are heartbroken to see this chapter in our lives, and in the life of Glens Falls, come to an end. Unfortunately, the extremely sluggish regional economy and the rapid rise of e-books have led to a shocking decline in our sales over the past year. We don't foresee conditions improving in the near future, and at this point, we have exhausted all our resources to keep the business afloat. We want to believe that bookstores won't die out entirely, but for the time being, the challenge posed by digital media, in all its forms, is simply too much for us to withstand." As they say, every cloud has its silver lining, and I suppose in this case, that would be the savings now available at Red Fox Books as they clear out their inventory. Even if you are guilty of owning a Kindle or other eReader, this is a great way to show your support for Glens Falls' beloved bookstore, buy local and send the owners of Red Fox Books off with your well wishes. Besides, nothing beats turning the pages of a real book that you can touch and hold and put on display, read to your children, etc. So get yourself over to Red Fox Books before it's too late, and take advantage of the savings. "If anyone is interested in buying all or part of our store, or in starting a different bookstore in this area, we would love to hear from you. As residents of Glens Falls, we do not want to live in a town without a bookstore, and we would be more than willing to assist a new store in any way possible. We believe there might be new models of bookselling that can be viable given the right owner with the right resources. If you are interested, please contact us at 518-793-5352 or [email protected]"